When you’re planning the perfect make-ahead dish for your spring and summer picnics or holiday gatherings, look no further than Classic Southern Seven-Layer Salad. This traditional seven-layer salad recipe is as versatile as it is delicious, and always receives rave reviews! You may remember, I mentioned in an earlier post that I am in the middle of a major kitchen remodel. Because I can’t cook, over the next few weeks, I will be showcasing a few of my favorite bloggers and their recipes. Today, I would like to introduce my sister, Chula King who hosts the Pudge Factor Blog. Chula is sharing one of my favorite recipes, Classic Southern Seven Layer Salad. 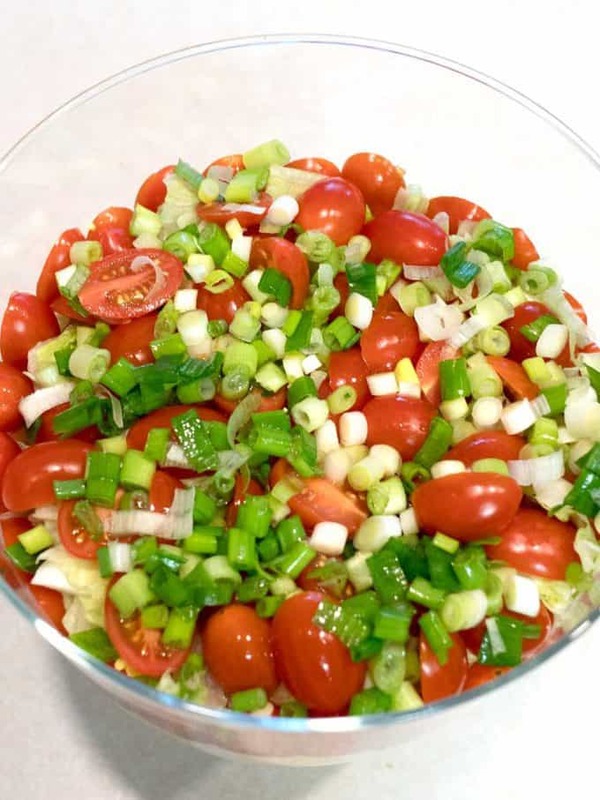 I know you will love this traditional seven-layer salad as much as I do and I hope you will also visit the Pudge Factor blog to check out some of her other delicious recipes too! Hi, all of you Grits and Pinecones fans. I was thrilled when my sister Sharon asked if I was interested in doing a guest blog! My blog is Pudge Factor, which may seem an odd name. However, in our house, “Pudge” refers to being satisfyingly full from a good meal – thus Pudge Factor! Actually, Pudge Factor was born in 1986 when I decided to put together a cookbook as a Christmas present for my family. The first edition of the cookbook didn’t materialize until 11 years later and went through several iterations after that. It quickly developed into my go-to cookbook. Because I wanted to have access to my recipes when I traveled, I decided to purchase the domain and upload my recipes to PudgeFactor.com. However, it wasn’t until 2012 that I actually decided to start a blog. The recipes in Pudge Factor represent a lot of experimentation through the years and chronicle our everyday eating. Therefore, they tend to be a bit eclectic. 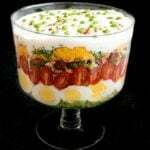 In keeping with Grits and Pinecones theme of Southern Cooking, I thought I’d share with you my Classic Southern Seven-Layer Salad, which is one of my most popular posts. I hope you like it as much as I do, and hope you’ll visit Pudge Factor and peruse some of my other yummy recipes. If you like this recipe, you might also like these other southern-style recipes: Southern Cheese Straws, Grits À Ya Ya (A.K.A. Shrimp And Grits), and Creamy Southern Coleslaw. I started by combining some mayonnaise, sour cream, sugar, shredded parmesan cheese, sugar, and white wine vinegar in a small bowl for the dressing. Then, I moved on to building the salad. 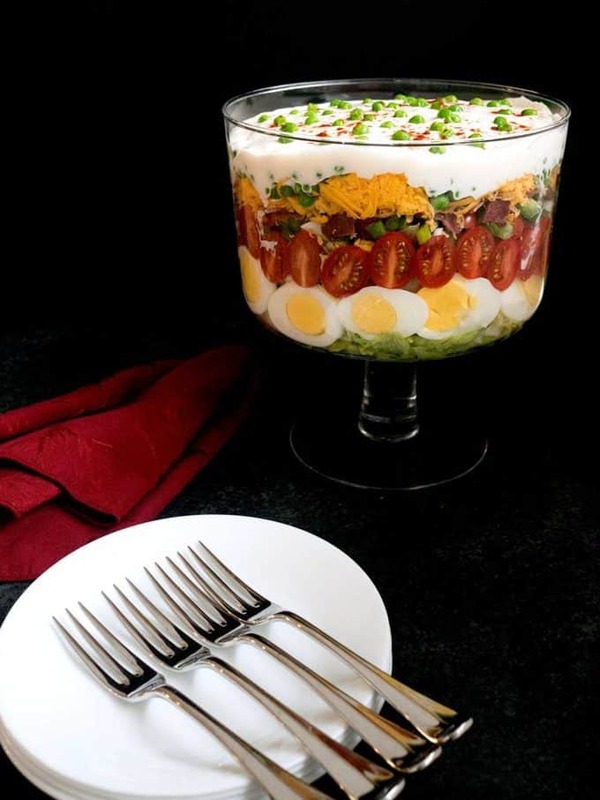 I like to make it in a clear trifle bowl to showcase the different layers, starting with a layer of bite-size pieces of iceberg lettuce. Next, I added sliced hard-boiled eggs. I lined the bowl with a ring of sliced eggs and put the rest on top of the lettuce (here’s how to make Perfect Hard Boiled Eggs Every Time). Then, I added a ring of sliced grape tomatoes above the eggs and placed the remaining sliced tomatoes on top of the eggs. For the fourth layer, I added the white and green parts of sliced scallions. I added the fifth layer of broken pieces of cooked and drained bacon and the sixth layer of shredded cheddar cheese. Finally, I added the last layer of green peas. I finished the salad by topping it with the dressing that I had previously made. To make the salad look more festive, I sprinkled on a few of the green peas and a little bit of paprika. I covered the salad with plastic wrap and refrigerated it overnight. Before serving the salad, I tossed it to combine all of the luscious ingredients. Yum! If you liked the recipe above, please consider rating it and leaving a comment below. Also, follow Chula on Pinterest, Facebook, and Instagram, and me on Pinterest, Facebook, and Instagram. And finally, to be the first to receive notifications of new posts by email, enter your email address in the Subscribe box of Pudge Factor or Grits and Pinecones. Thank you so much for visiting! 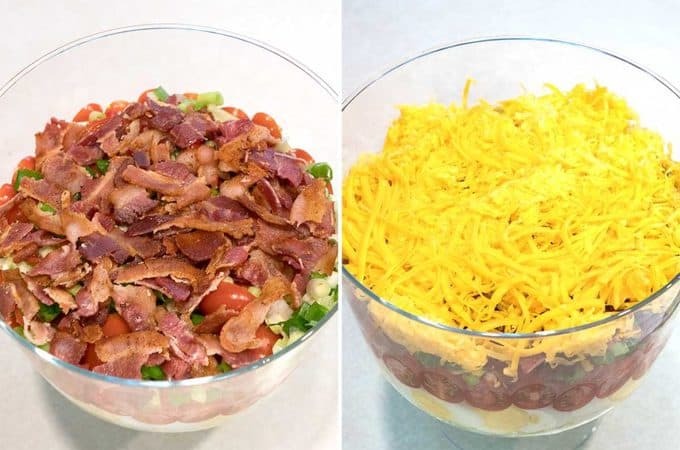 When you’re planning the perfect make-ahead dish for your spring and summer picnics or holiday gatherings, look no further than Classic Southern Seven-Layer Salad. This traditional seven-layer salad is as versatile as it is delicious, and always receives rave reviews! Whisk together all dressing ingredients in a small bowl until smooth and creamy; set aside. 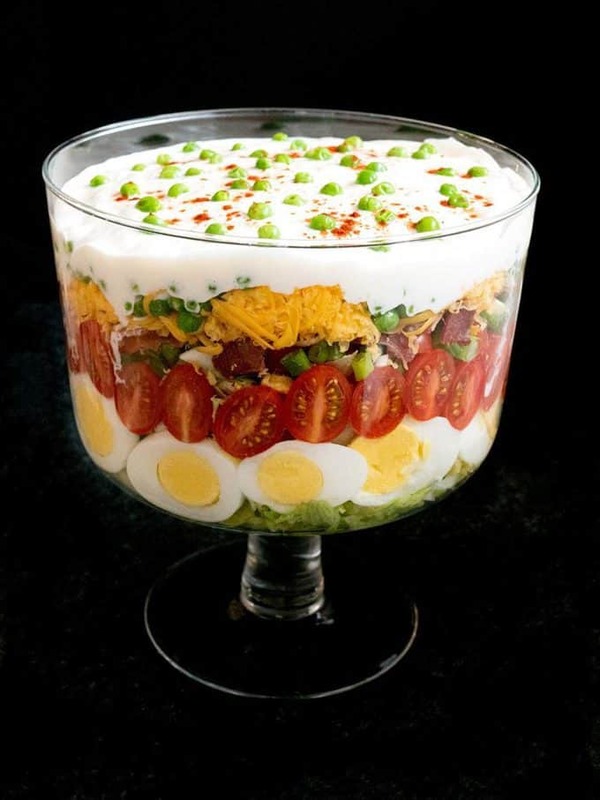 Add lettuce to trifle bowl, or another clear bowl. Place a ring of sliced eggs around the perimeter of the bowl, nestling them in the lettuce for support. Place remaining eggs on top of lettuce. Place a ring of sliced grape tomatoes around the perimeter of the bowl above the eggs; place remaining tomatoes on top of egg layer. Layer the bacon, green onions, Cheddar cheese, and green peas in that order on top of tomato layer. Spread dressing on top of salad. If desired, sprinkle a few green peas and paprika on top for a festive look. Cover with plastic wrap and refrigerate for at least 8 hours, and preferably overnight. Before serving, toss to combine all ingredients. Hi Beverly, thank you so much for your sweet comment! I’m so glad you enjoy them! Looking foreward to more [nteresting recipes!